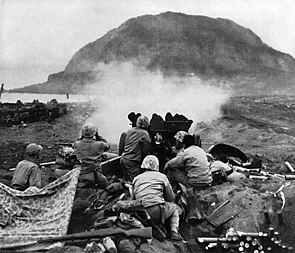 A U.S. 37 mm (1.5 in) gun fires against Japanese cave poseetions in the north face o Moont Suribachi. The Battle o Iwo Jima (19 Februar – 26 Mairch 1945) wis a major battle in which the U.S. Marines laundit on and eventually capturt the island o Iwo Jima frae the Japanese Imperial Airmy during Warld War II. ↑ 1.0 1.1 1.2 1.3 Burrell 2006, p. 83. Burrell talks about how many historians have overestimated the number Japanese defenders, with 20,000 and even 25,000 listed. Burrell puts the range between 18,060 and 18,600, with exactly 216 of these taken prisoner during the course of the battle. Another 867 preesoners were taken by the U.S. Army between April and June, after the Marines had left. ↑ Taki, THE HISTORY OF BATTLES OF IMPERIAL JAPANESE TANKS. ↑ B. L. Crumley, "The Marine Corps: Three Centuries of Glory", Jan 19, 2013. The total breaks down as follows: 361 artillery pieces of 75 mm caliber or larger, 12 320 mm spigot mortars, 65 medium and light mortars, 33 naval guns, 94 anti-aircraft guns of 75 mm or larger, 200+ anti-aircraft guns of 20 mm or 25 mm, and 69 37 mm or 47 mm anti-tank guns. ↑ Morison, Samuel Eliot (2002) . Victory in the Pacific, 1945. Volume 14 of History of United States Naval Operations in World War II. Urbana, IL: University of Illinois Press. ISBN 0-252-07065-8. OCLC 49784806. This page wis last eeditit on 10 Mairch 2018, at 22:51.